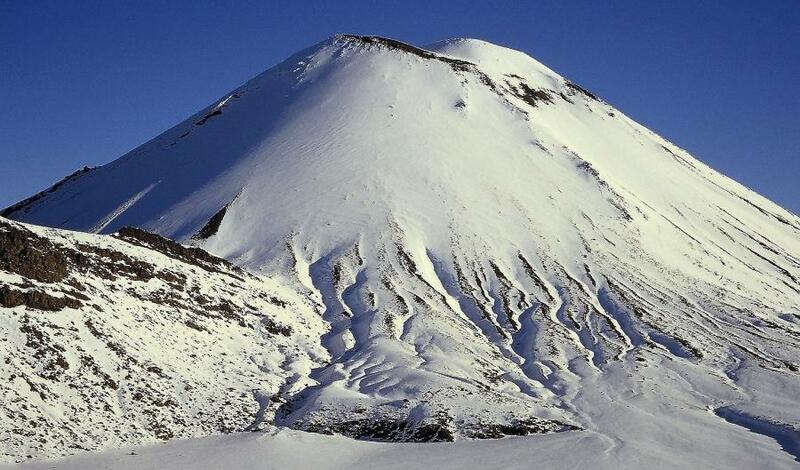 The symmetrical cone of Ngauruhoe is a consistent slope of scoria and or snow; the views will be the main point of difference on different approaches. The common ascent route starts from Tongariro’s South Crater entrance, after climbing up out of the Mangatepopo Valley. In summer, aim for the central lava rib; the climb is considerably more entertaining in winter when there is snow or, better yet, ice, usually up the shallow gully that leads into the crater area. Watch for slides when the afternoon sun warms these slopes. Those in search of a longer and more remote alternative could climb the mountain from Waihohonu Hut, off the Desert Road. Take the track towards Oturere as far as the ridge running up to Tama. Climb this ridge until you can sidle towards the base of the volcano’s cone. Onwards to the top.